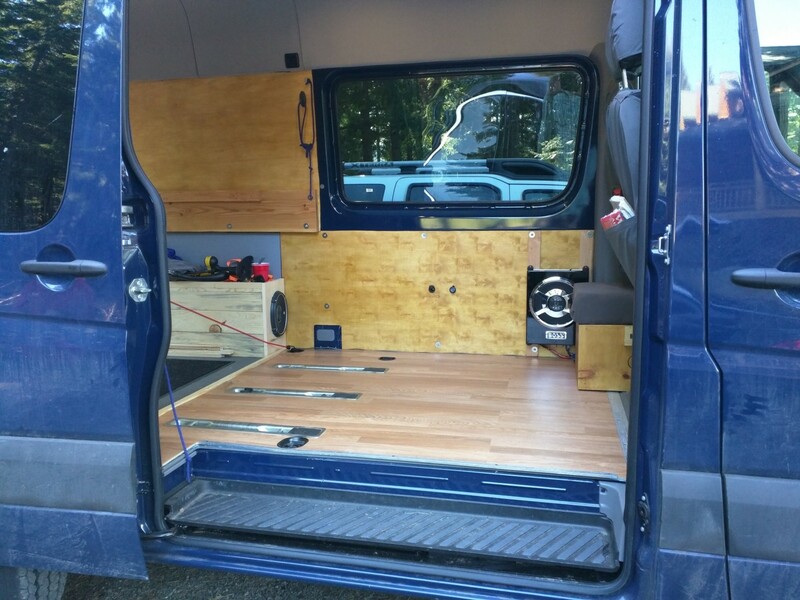 We decided to put laminate flooring in the front half of our van, leaving the back half for the rough and tumble of cargo. 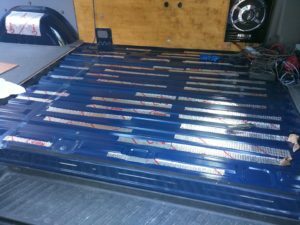 We worried that if we made the whole thing laminate flooring our cargo – like out refrigerator/cooler, would just slide around everywhere. 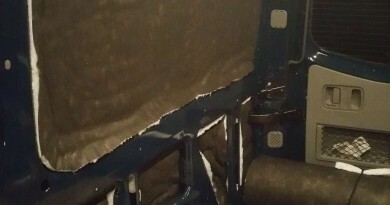 So half the van was done with the laminate. Overall this project was very easy. We purchased the 3 boxes of laminate flooring from home depot and purchased the blue underlayment from amazon. 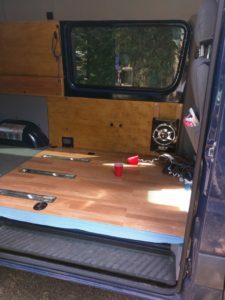 We used the existing plywood floor as template, so we could cut out the openings for the seat and tie down escutcheons. That was probably the trickiest part – but not that tricky, really. 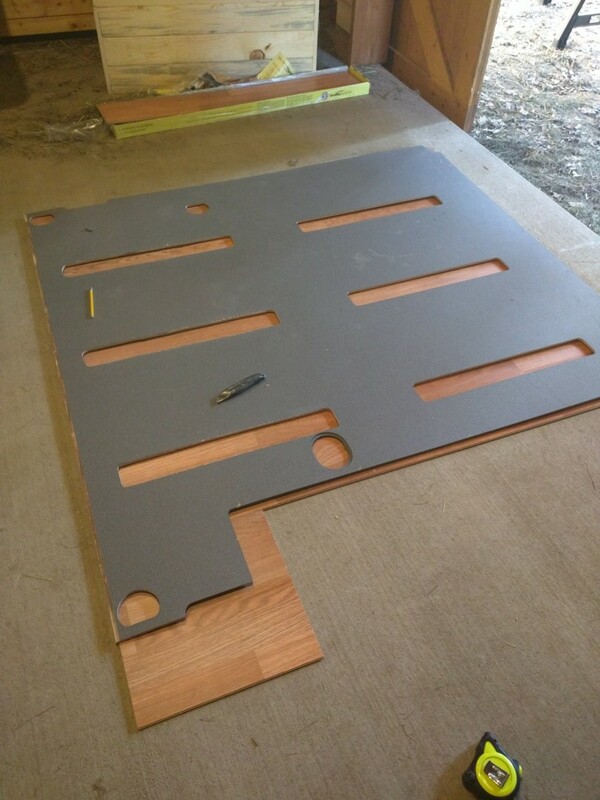 We first built an oversized square of laminate flooring on the flat concrete garage floor. Then we took the factory plywood floor and placed it over the top of our temporary laminate square. We traced the openings and the outside edges. We returned the original factory plywood floor back to the van (after placing some noico sound deadening panels in various places). We carefully labeled each piece of laminate as we took the square apart. Then cut out the pieces per the traced lines. We put down the blue underlayment on top of the original plywood floor. Finally, we reassembled the now cut out laminate flooring inside the van and bolted it down with the escutcheons. And that, was it. 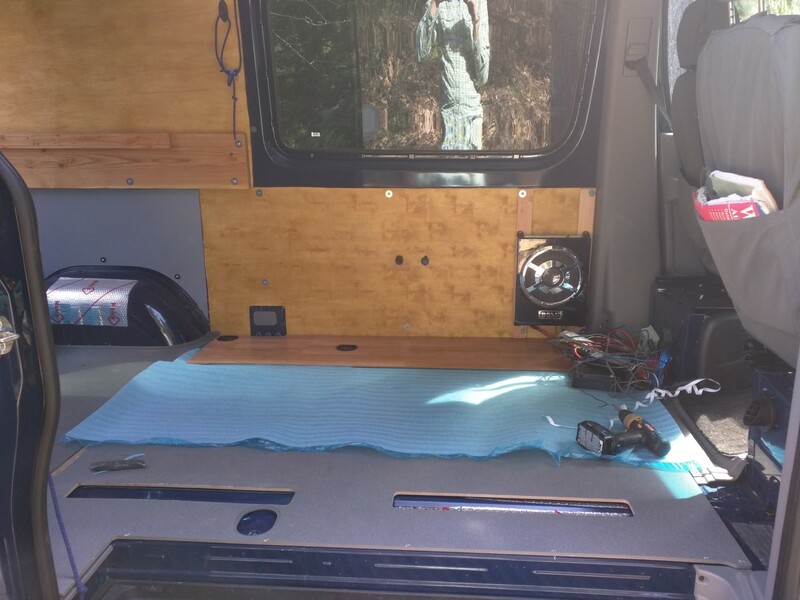 The photos below show the progress in order from start to finish. Thanks so much for the Reply Austin! I much appreciate it! And I really like the way you did it. 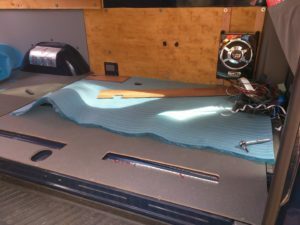 I was wondering if simply drilling into the current plywood that came with my vehicle and setting the width very tight and screwing into the walls would work. It looks like for you it did quite well. I think I’ll go that route. Thanks again and have a great Thanksgiving week! I absolutely LOVE your build! We just purchased a sprinter 170″ and are super excited to get everything underway. In all of the reading I have done, the only thing that has left me puzzled is knowing where I can / can’t anchor to the floor and what to use? 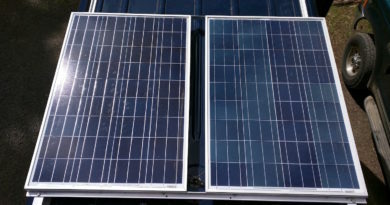 I’ve heard self-tapping screws and bolts, but I cannot seem to find how long they should be and where I can drill. Any advice would be so much appreciated. Mike – Thanks for reading! Our build isn’t very fancy – but it certainly gets the job done – we love it too! Unfortunately we haven’t done much drilling into the floor, with the exception of moving the back seat back and cutting a few holes under the passenger seat for the heater. 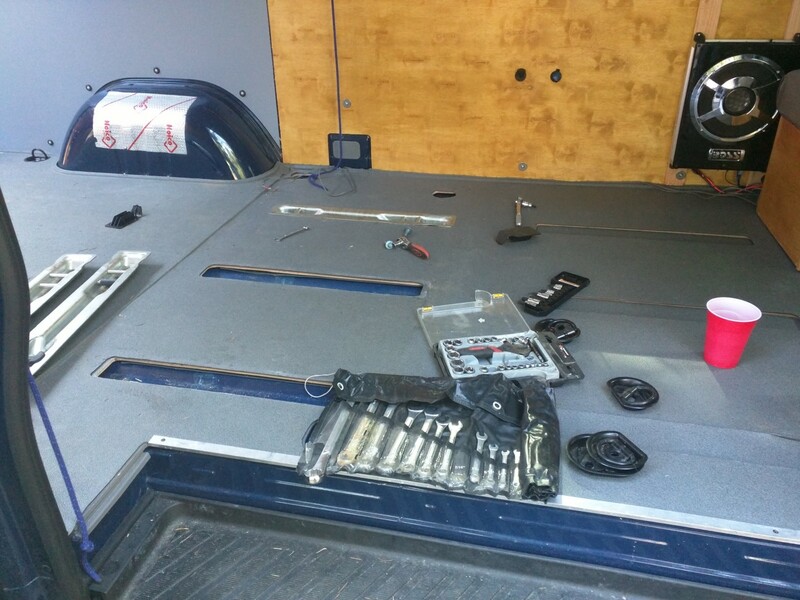 For the back seat, the captive nuts were already there – we just opened up the floor sheet metal to find them. As far as the rest of our build, it basically sits on top of the floor. 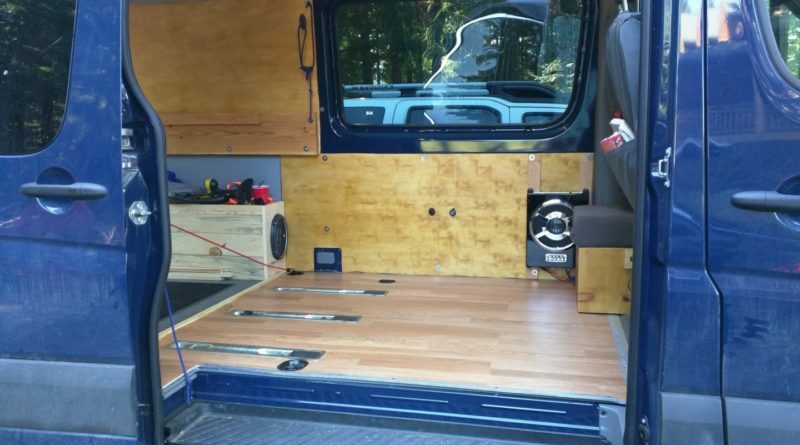 Our wheel well boxes are just anchored down into the plywood floor only with tiny wood screws. 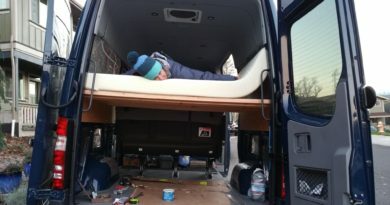 Sorry I can’t be more help – I only have my simple experience with my own van. 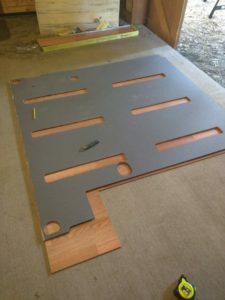 I guess I should also add that for our laminate floor install it is not screwed into anything. 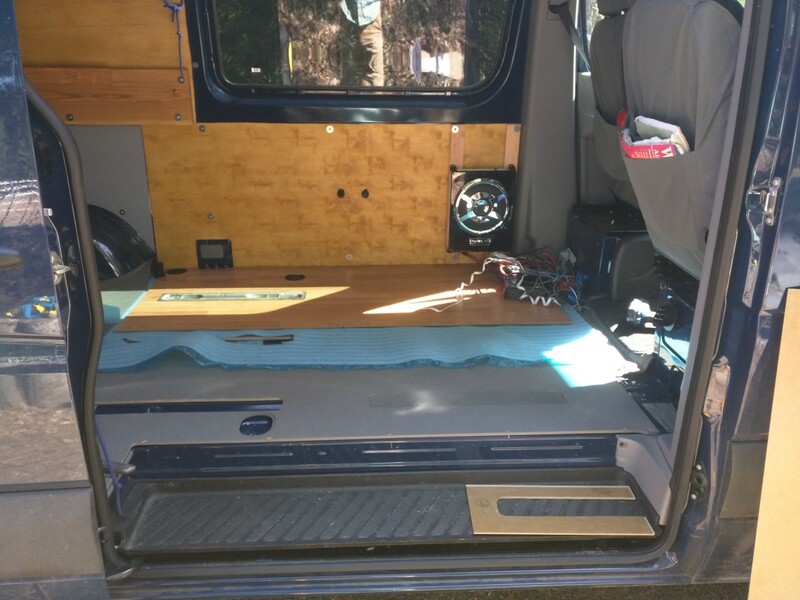 It just ‘floats’ between the fixed edges of the van body and where it’s held down by the back seat escucheons and the tie down points. I would be worried about putting any new holes in the floor, for fear that they would leak. But I am sure a lot of people have done it and have ways to mitigate that if you check out the sprinter-source forums.